Target Beauty Box Fall 2014 Available NOW! Hello BEAUTIFUL! We’ve rounded up our favorite beauty products (so you stay in-the-know), individually these items are valued at up to 28 but as part of the Target Beauty Box they can be yours for just 7. Try them, tote them, take them with you were sure youll love them as much as we do. Find out more about these products and others like them at Target.com/TheLatest.Beauty Box Includes: Elnett Extra Strong Hold Hairspray (2.2 oz): A favorite of runway stylists, this massive-hold spray adds brilliant shine and brushes out in a flash, leaving hair with a clean, satin finish. Fekkai Professional Blowout Hair Refresher Dry Shampoo (1.7 oz): Revive your blowout instantly with an airy mist that absorbs dirt and oil leaving hair clean, fresh and lively. Laneige BB Cushion Sample (Target Exclusive): Pat and press your way to perfect skin with revolutionary 5-in-1 cushion technology that brightens, protects, cools, covers and prevents shine. NYX Jumbo Eye Pencil (.18 oz): Glide-on glam. A velvety blend of mineral oil and powder, this creamy pencil does double beauty duty as a radiant eyeshadow. LOréal Colour Riche Extraordinaire Lipstick (.18 fl oz): Knockout hues meet conditioning care in a gorgeous formula infused with precious micro-oils that intensify color, smooth lips and add shine. Colors will vary. Due to wanting to get you the best price, well pay to ship it to you, but please allow up to two weeks for delivery. The price for this box is $7 + tax, coming out to $7.39 for me here in Wisconsin. This price includes shipping and handling. You do not need any code or to be a Target Reed Card holder to receive free shipping. I’ve purchased one other Target Beauty Box in the past and for the price, I really liked it. For a minimal fee, I think you get a good variety of products to try out that are worth it. I mean, the NYX Jumbo Eye Pencil alone is great (can’t guarantee the one you receive will be Milk like in the photo, but here’s hoping! ), and there’s usually a coupon for your next Target beauty purchase. If you want to snag yours, click the link. Hurry and get yours while supplies last! Thanks to MUA, I was tipped off on another beauty box to hit the market. 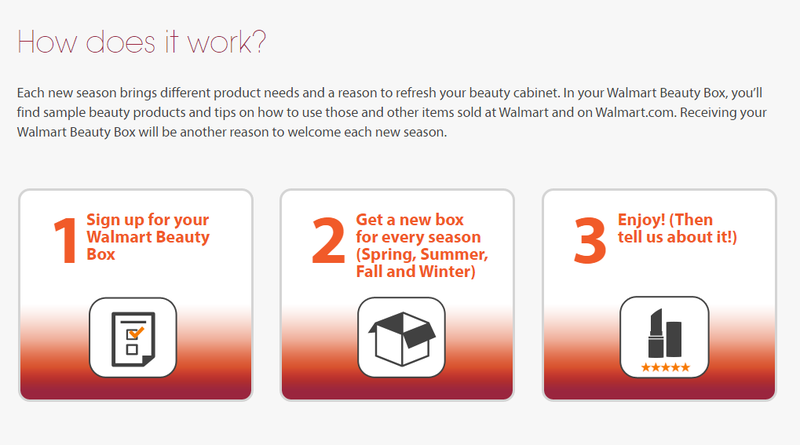 Walmart isn’t the first superstore to release its own beauty box. Target releases boxes a couple times of year, and it’s not a subscription; sales are first come, first serve, and once it’s sold out, it’s gone. While the boxes will be similar in that they both contain products that can be found at the respective stores, Walmart will work on a subscription basis. Every three months, or every “season” (living in the Midwest, we have endless winter, 5 minutes of spring, construction season aka. summer, and then 30 seconds of fall before we’re plunged back into winter), you will be charged $5 for a box that contains products suited for the appropriate season. Based on the picture above, these samples will be of cosmetics, skincare, hair care and personal care (there’s deodorant, and also looks like there might be a fragrance?). The box itself is free and the $5 fee covers the shipping and handling, much like the Target beauty box that costs $5 + tax and ships free. You won’t be charged the $5 until your box ships. I know in the Target beauty box I received, they included coupons either for the specific products found in the box or just a general $5 off of however much of a beauty purchase. I would expect Walmart will do the same, and I’ll be sure to let you know once I receive mine! My order is currently being processed, and I should receive it in a week or less once it ships out, so expect a review soon. As a fan of Target’s beauty box and drugstore products in general, I’m excited for this. And $20 for the entire year? I could easily drop $20 or more in one shopping trip to a superstore! The signup process is straight forward and simple, doesn’t take long at all. Like any subscription service, you set up an account, that way you can change any information such as address or payment info later if needed. If you’d like to signup, click here to be sent to the signup page. The Target beauty boxes always sell out quickly, and it’s yet unclear when Walmart will close their signup, so if you’re interested I suggest going to their site ASAP! What do you think of stores like Target and Walmart creating their own beauty boxes? Do you like this? Will you signup for this? Let me know in the comments below.